Voters will decide on Thursday whether or not the UK will withdraw from the European Union. At one level it is a fundamental political choice. Does the UK want to face the world alone as a limited scale island nation or to remain an influential part of the European Union — the world’s largest economy? Does it want to stand apart from Europe or try to shape it at this complex hour in global affairs? These are not questions that an American should presume to answer. But Thursday’s choices will have immediate financial and economic consequences. And they can be assessed by outside economists. My judgments are I believe widely, though not universally, shared by both progressive and conservative global financial and economic analysts. Put simply, Brexit could well be the worst self-inflicted policy wound by a G7 country since the formation of the G7 40 years ago. It is a risk no prudent policymaker would take. And the risk is not confined to the UK. In the current context, Brexit would unsettle the global economy and possibly tip it into recession. Four points are crucial. First, unlike almost all other economic policy choices, Brexit is irreversible. François Mitterrand’s lurch towards socialism, Ronald Reagan’s excessive tax cuts and Japan’s encouragement of bubbles were all egregious errors but all were reversed, albeit not before substantial damage had been done. Divorce can be reversed by remarriage if regretted. There is no reversing Brexit if it proves unwise. Indeed, given the EU’s very strong incentive to discourage further dissolution, it is far from clear that there would even be concerted efforts to minimise its cost. Second, markets are likely to suffer extraordinary volatility in the wake of Brexit. A Black Friday could follow referendum Thursday. It is likely that foreign investors in British stocks would lose 15 per cent off the bat, adding together market declines and currency losses. This is a judgment supported by the gyrations in markets induced by relatively small fluctuations in the perceived chance of Brexit and by the very high prices commanded by out of the money options. The truth is that even with all the regulatory changes that have been put in place we do not know for sure how the financial system will respond. A return of systemic risk as large losses lead to cascading liquidations cannot be ruled out. At a time when central banks have far less ammunition than they did in 2008, the consequences could be grave. Third, Brexit will undermine confidence and increase uncertainty. No one knows what the new structure will be or how soon it will emerge. Quite likely, Brexit would lead to changes not only in Britain’s relationship with Europe but within Europe itself. While businesses wait to see what happens, they will hold off on new investment. Some will decide that it is much safer to base European operations outside the UK. Others will simply avoid hiring until matters are clear. There exist contingency plans to move hundreds of thousands of financial sector and other workers out of Britain. If matters play out slowly, they may be acted on. Given adverse markets, huge uncertainty, the likely absence of either expansionary fiscal policy (because of government policy commitments) or incrementally expansionary monetary policy (because of lack of room to cut rates), I believe Brexit would likely be followed by a recession in the UK. Fourth, Brexit would quite likely have large contagion effects. So irrational and dangerous an act in a traditional bastion of mature democracy would prompt a global reassessment of the likelihood of dangerous populist policy. The result could be large and destabilising asset price declines and capital flows towards assets such as gold and the Swiss franc. A vicious cycle of falling asset prices, reduced confidence and further declines could ensue. I am reminded of the Smoot-Hawley tariff and the Depression. No direct calculation of its impact can explain more than a tiny part of the Depression. But it may have been a psychological tipping point. Brexit, too, could have global effects that dwarf its direct impacts. None of this certain. But prudence dictates the avoidance of needless risk. Remain is the only rational economic choice. THE future is a paradise of technological abundance, some say, in which paid work is optional and no one goes without. A tiny glimpse at what that future might look like is on offer in the village of Maricá, a small seaside town just a short drive from Rio de Janeiro. In December 2015 each of the town’s 150,000 residents became eligible to receive a monthly payment worth just under $3, financed with the help of Maricá’s share of Rio state’s oil royalties. The sum is small but for Washington Quaquá, the mayor of Maricá and architect of the payments plan, the idea is a big one. He says he is guided by “an ethical precept” that may realise his lifelong dream of an egalitarian society. His programme is an example of a “universal basic income”: a no-strings cash payment to everybody in a given jurisdiction. The idea has a long pedigree, endorsed by great figures of the enlightenment such as the Marquis de Condorcet and Thomas Paine. 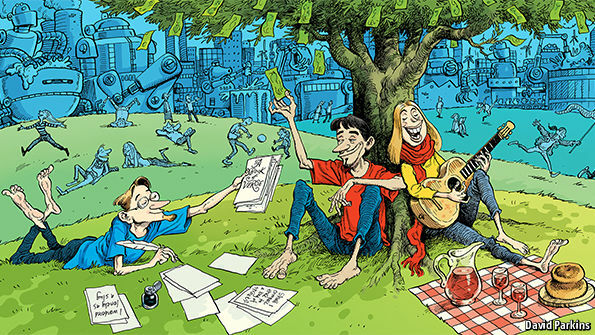 Three centuries on, a handful of governments around the world, mostly in rich countries, are launching experimental basic-income programmes, or at least considering the idea. Finland will roll out a trial programme next year, in which some citizens will receive unconditional cash grants of up to €800 ($900) per month. Similar programmes are being mulled in several Dutch cities. On June 5th the Swiss will vote on a constitutional change to introduce a basic income for all citizens. Political activists and thinkers across a broad array of ideologies, from libertarians to social liberals to the hard left, are intrigued, or even keen. The Cato Institute, an American think-tank which spends much of its time calling for a smaller state, published a sympathetic analysis of the policy in 2015. It feels that, though it might prefer a world with no government redistribution, a basic income is the simplest, least intrusive and least condescending way to provide redistribution if redistribution there must be. American liberals including Paul Krugman, an economist and columnist, and Robert Reich, a former labour secretary, are also interested. 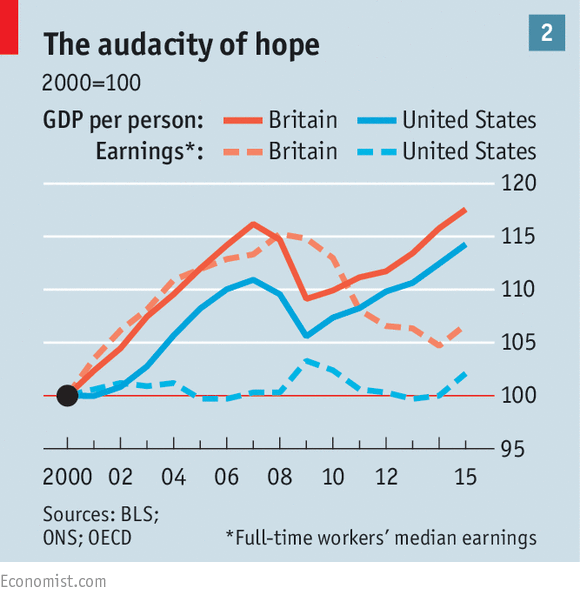 Along with writers such as Anthony Atkinson, a British economist, and Andy Stern, an American union leader, they see a basic income (in some form) as a way of expanding the welfare state to reduce growing inequality (see chart 1). The idea also has some support in the further reaches of the left as, in the words of a paper published in 1986, “A capitalist road to communism”. Unsurprisingly, given the Utopian and libertarian flavour of the idea, Silicon Valley is interested, too. Some of the people behind today’s technological change see universal basic income in similar terms—a way of assuring a living for all in a world of robots and artificial intelligence. To the extent that such disruption is part of their business model, this beneficence is also a way to neutralise complaints about the havoc their innovations may wreak. Albert Wenger, a partner at Union Square Ventures, a technology-oriented venture-capital firm, argues in favour of the policy in a new book “World After Capital”. Sam Altman, the founder of Y Combinator, a startup incubator, plans to pilot a basic income of $1,000-2,000 a month in Oakland, a city in California. “Fifty years from now...it will seem ridiculous that we used fear of not being able to eat as a way to motivate people,” is how Mr Altman puts it. Backers make other arguments, too. Workers could take more time to train and explore different careers. The security of a basic income could boost enterprise, because leaving a job and using up savings to open a business are more palatable prospects in such a world. So is finding fulfilment in unremunerated ways. A basic income could also help to right certain old injustices. Women do the lion’s share of the world’s unpaid labour. In most of the world, they work more hours a day than men do, but command a lower share of financial resources, largely because they take on more unpaid child care and responsibilities for the family home. A universal basic income would shift purchasing power toward people who do work which, though valuable to society, is not rewarded financially. As well as offering the possibility of a simpler and perhaps fairer welfare state, supporters of a universal basic income say it answers fears that paid work will break down as a mechanism for distributing purchasing power. In recent years, across many rich economies, the wages earned by the typical worker have grown pitifully slowly—and by less than GDP per person (see chart 2). Low wages appear to be necessary to coax firms into taking on new employees, often in very low-productivity jobs that could potentially be done by machines instead. This could be a temporary phenomenon; the workers at the bottom of the income scale may eventually shift into better-paid work, or future generations may cleverly invent new sources of employment for themselves. If it is a permanent state of affairs, though, then a basic income might be a way of making sure that everyone shares in society’s progress, at least to some extent. But how such a step might be made to work, and what harmful effects it might have, are still open questions. The Swiss government, which is arguing for a “no” vote in this month’s referendum, worries that a basic income would be ruinously expensive and morally corrosive, leaving the country with unsustainable public finances and a society of unmotivated loafers. Both supporters and critics agree that universal basic incomes would challenge the centrality of paid work to the way people live. A world with them in place could be as different from today’s as that of public education and guaranteed pensions was in the 1950s, compared with a century before, when the loss of a job could mean starvation for a worker and his family. The reforms introduced by Otto von Bismarck, the German chancellor who created the world’s first modern welfare state, were intended to undermine support for socialism and build working-class backing for the German empire. The system he put in place was conceived as an insurance against the woes of hardship, rather than as a natural entitlement. Over the following century, as trade unions sought a better deal for labourers, work was a central principle of organisation. Those reforms created the developed countries’ modern welfare systems: some sort of unemployment benefit, health-care provision, universal education and state pensions. Universal-income ideas such as those championed by Douglas were for the most part peripheral during the rise of the welfare state. In the 1970s, in part because of flaws that were becoming apparent in the existing structures, they briefly interested mainstream policymakers. They were experimented with in Canada, where Douglas’s ideas had always had a following. In Alaska a basic income was discussed as a way to distribute oil riches. George McGovern, the Democratic candidate in the 1972 American election, proposed a “demogrant” of $1,000 ($5,700 at today’s prices) to every citizen, a policy drawn up by James Tobin, an economist. McGovern lost 49 of the 50 states, but a reform to the welfare state that was similar, in some ways, still went ahead. In 1975 Congress created the Earned Income Tax Credit (EITC). It was a sort of “negative income tax”, an idea promulgated by the economist Milton Friedman, which provided support in inverse proportion to a worker’s income. Like Tobin’s demogrant, Friedman’s idea was in part a response to worries about the “poverty trap” in existing welfare systems. The way that benefit programmes cut off at particular income thresholds provided a strong incentive for recipients not to earn too much. The demogrant avoided the trap by not phasing out benefits as incomes rose. The EITC lessened it by tapering away only gradually. For the unemployed, this increased incentives to work by amplifying the income earned by the lowest-paid. Two things made the second policy much easier to sell: it was cheaper, and it was only available to those in work. Britain, France and others adopted EITC-like working-tax credits in the 1990s and 2000s. Wage subsidies were increasingly seen as important for battling poverty. Today three decades of unequal economic growth, the pain that followed the financial crisis in 2008 and the disruptive potential of digital technologies have once again focused attention on the welfare of the struggling working class. 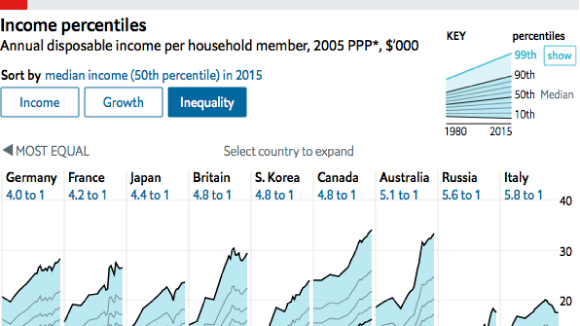 One response, in much of the developed world, has been to raise minimum wages. But economists warn that minimum pay can only rise so much before employment suffers. Rising labour costs encourage firms to look for labour-saving alternatives, an investment in productivity which might be good for GDP but would exacerbate the shortage of jobs for less-skilled workers. Populist politicians argue, wrongly if seductively, that the key to boosting worker welfare is to undo the liberalising measures of the previous generation. 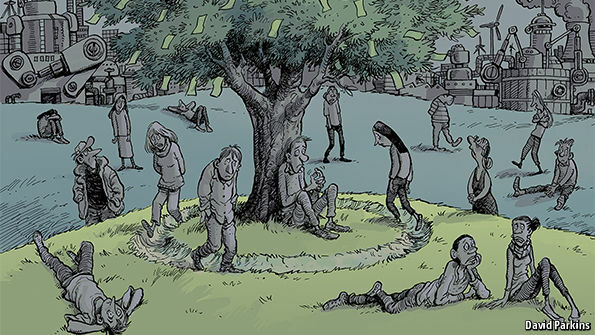 Supporters of a universal basic income, on the other hand, claim that the re-engineering of the welfare system they envisage could allow societies to enjoy the fruits of dynamic economies while also ensuring they are widely spread. Their argument runs as follows. The wage-subsidy approach to welfare has gained ground because it has real effects on poverty, it maintains incentives to work and it doesn’t cost all that much. 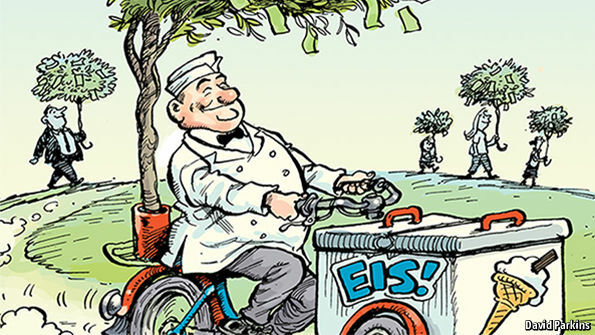 America’s spending on its EITC programme, for example, is just 8% of its spending on public pensions. But it has three problems, too. Though such subsidies reduce the poverty-trap effect, they do not eliminate it; generous wage subsidies that phase out as incomes rise reduce the incentive to find better-paying work, because some of the gain received from a raise is offset by a reduction in benefits. A gently sloping phase-out answers the problem to some extent, but it also increases costs, with more of the workforce qualifying for at least some of the benefit. Those cost increases highlight a second concern, of political economy. The targeting which keeps these programmes cheap also limits their constituencies. That makes them cuttable. In recent years austerity-minded governments have been more willing to gut means-tested welfare payments than to take an axe to entitlements such as universal pensions. It is harder to build broad support for programmes which, by design, are aimed at a small underprivileged part of the citizenry. Programmes for the poor, who have little to spend on lobbying and also tend to vote less, are vulnerable to being chopped. Perhaps most importantly, such tax-credit policies begin to break down if there is no prospect of jobs that make use of people’s skills. When manufacturing jobs that were the keystone to a regional economy move abroad, for example, people with few prospects look for alternative means of support, such as disability benefits. In most age groups in Britain the share of population claiming disability benefits is systematically and substantially above the level of the 1980s, despite efforts to control growth in disability-benefit costs. Since 1988, America’s disability payments have risen from one in ten of every social-security dollar spent to one in five. Those unable to find work or get on such programmes sink deeper into poverty. In America many are slipping through the cracks of a conditional welfare system: the number of people living in extreme poverty rose sharply between 1996 and 2011, from 636,000 to 1.5m, according to Luke Shaefer of the University of Michigan and Kathryn Edin of Harvard University. A universal basic income might solve these problems. As Tobin argued, a flat basic-income payment eliminates the poverty trap. Since the benefit would not phase out, there would be no reduced incentive to seek additional work hours or income. Because it would be paid to all citizens, its advocates hope that it would enjoy the political support of an entitlement programme, and come to be seen as a right of citizenship. And it would clearly benefit people with no prospect of work, and thus most of those in extreme poverty. But that still leaves very hard questions, of which the toughest is cost. Any universal basic income generous enough to make a dent in poverty would be very expensive. As Mr Atkinson notes, a universal basic income worth a given percentage of the average income (measured as GDP per person) requires a proportional rise in tax collection as a share of GDP. In other words, a basic income of 15% of average income would require tax revenues of 15% of national income dedicated to it. That is a lot of tax for not much basic income (only about $8,000 in America, in this example). Some of the money needed could be drawn from other welfare programmes displaced by the basic income. 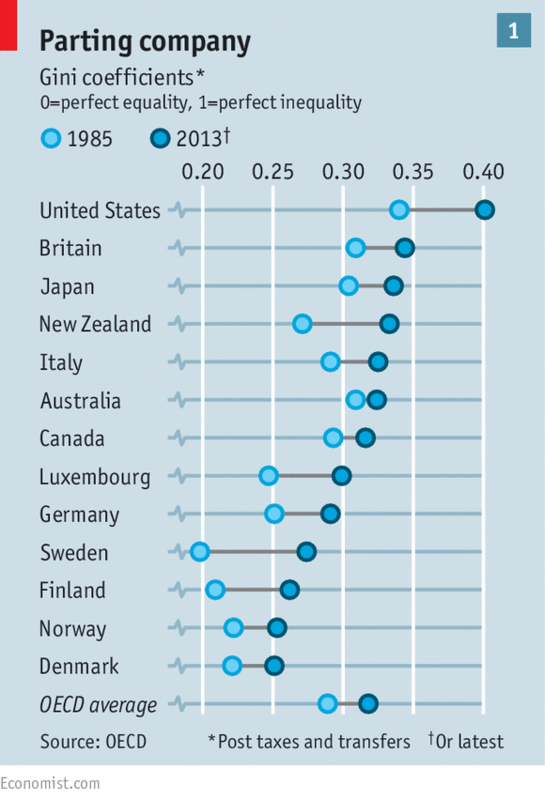 The most generous states in the OECD, a club of mostly rich countries, spend nearly a third of GDP on social programmes. In Finland, where such spending, less the share devoted to health, accounts for about a quarter of GDP, dividing what is spent across all citizens would yield a payment of close to $10,000 for every man, woman and child; in America the same exercise would yield a payment per person of about $6,000 (see chart 3). This would transfer a lot of money from today’s welfare recipients to people already in work. The largest group of losers would be old-age pensioners, the people who, in most countries, already enjoy a basic income (one that in America costs more than ten times as much as EITC does). It is possible that providing a less generous basic income to all could help sever the link between receipt of a pension and retirement, encouraging more of a balance between work and leisure for adults of all ages. It might also help the governments of countries with ageing populations manage demographic change, by encouraging older workers to stay working for longer, and by balancing the fiscal burden of government income support across people’s lives. But politically, the scope for reductions in pensions is likely to be slim. It is hard to see how a universal basic income of even moderate ambition would not require new forms and levels of taxation. 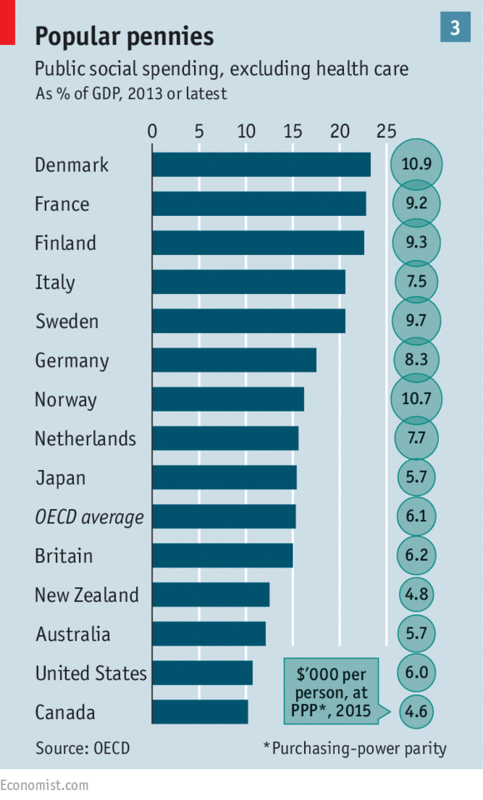 As a share of GDP, taxes on income and profits in the OECD range from about 12% in America and Britain to 33% of GDP in Denmark. The share has fallen as often as it has risen over the past decade or two. It is plausible that the tax take, especially in the countries with the lowest share, could go up without many adverse effects. If America is unlikely to become Denmark, it might nevertheless become Australia, with a 15% share of GDP taken in such taxes. That would represent half a trillion extra dollars a year. Raising taxes on income and profits has its risks, though. It increases incentives for avoidance and evasion, and reduces the incentives for the most productive workers to work and for companies to invest. An alternative would be to increase income through more efficient taxes, such as value-added tax (VAT). Most European countries raise at least 10% of GDP through taxes on goods and services, primarily VAT. 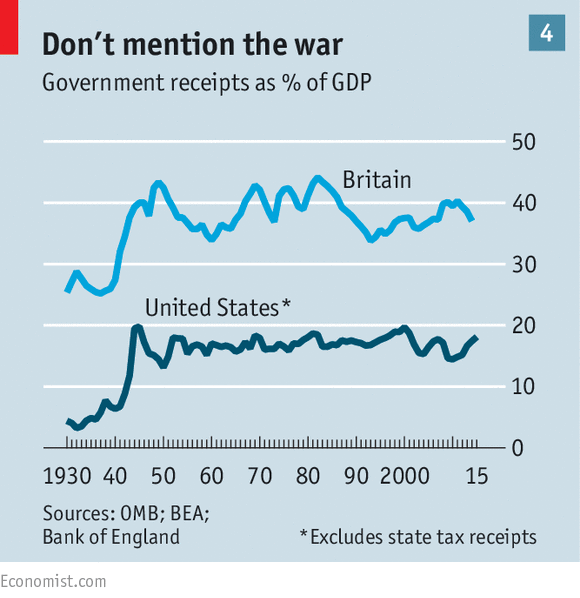 America, in contrast, raises only 4.5% through taxes on goods and services, none of which is collected in VAT form. But although a VAT is efficient, it is also regressive, hitting poorer people relatively harder. In some places payments for natural resources could provide some funding. Oil revenue pays for most of the Maricá scheme, and allows Alaska’s Permanent Fund to pay an annual dividend to each of the state’s citizens (last year’s was $2,072). Not every state has a commodity that it can tax that way; but every single state has perhaps the lowest-hanging of all taxable fruit—land. A land tax has the advantage of being progressive. Unlike taxes on income, land taxes do nothing to encourage apathy or avoidance; rather, they provide an incentive to owners to get the most out of their property. And they can also be lucrative. The sum value of all land in America, according to one recent estimate, is about $23 trillion, or 1.6 times GDP. A land-value tax of 5% would raise a little over $1 trillion, which works out at about $3,500 for every American, or $8,500 for every American household. Thomas Paine would have relished such a prospect. His case for a basic income justified it as a quid pro quo for the existence of private property. Before the advent of private property, he believed, all men had been able to support themselves through hunting and forage. When that resort is taken from them, they should be compensated by means of a “natural inheritance” of £15 to be paid to all men every year, financed from a “ground rent” charged to property owners. What might have seemed like common sense to Paine, though, might not be so immediately appealing to those hit by a trillion-dollar land-tax bill. Acceptable levels of taxation do change over time. The original growth of the welfare state provides an illuminating example. At the turn of the 20th century, government spending was about 15% of GDP in Britain and less than 10% of GDP in America. By 1960, those percentages had risen to nearly 35% in Britain and 30% in America. But the fact that such an increase has been carried off once does not mean it can be again. Today’s combination of stagnant pay and falling labour-force participation is serious, but it is not on a par with, say, the Depression or the world wars that bracketed it, which drove the expansion of the state’s role in the economy (see chart 4). Things will need to become a lot worse to generate political support for the radical changes to budgets and tax systems a universal basic income requires. Cost is not the only concern about a universal basic income. Many worry that a general disengagement from work might prove alienating, and money for nothing socially corrosive. People rely on work to provide order to their day and purpose to their lives, not just for money to pay for food and shelter, and may not find purposeful, satisfying alternatives in its absence. Analysis of time use by Americans who suffered a loss of work during the recent recession found that about half of the spare time went to leisure, mostly sleeping and watching television. In general retirees who continue to work part-time are happier than those who do not work, though it is worth noting that this is not the case for those who feel forced to keep working to make ends meet. In experiments with a guaranteed income in Manitoba, a Canadian province, in the 1970s overall labour-market participation did not change very much. Later analysis has suggested that there were widespread non-economic benefits—less use of mental-health services, fewer hospital visits and so on. But such experiments, limited in space and duration and subject to what is known as the “Hawthorne effect”—change that comes about simply because people know there is an intervention afoot—may not be good guides to the effects of a universal system. Plenty also fret that a world of universal incomes would mean even higher hurdles to migration than today’s. The evidence that benefits are a draw to immigrants is thin—they care more about jobs than the generosity of the welfare system. But if rich countries began offering basic incomes generous enough to live on, migrants might instead be drawn by the money on offer. (The payments being considered in Finland and the Netherlands are vastly larger than the tiny income available in Maricá, for example.) Rich countries would face the choice of paying generous benefits to immigrants, shutting borders, or tolerating the growth of a second-class citizenry of foreign workers without recourse to the welfare state. It may be, too, that the need for a universal basic income never becomes truly urgent. Silicon Valley visionaries could be wrong in their belief that a thriving 21st-century economy will be one where jobs go to robots faster than new jobs can be created, and that a universal income is the way to make that transition humane. The capitalist system has been remarkably good at finding new ways to work as it gets rid of old ones. But the past is not always a good guide to the future. The welfare system grew up to service a model of industrial modernity. It is failing the poorest in society and may be at risk from technological upheaval. It may yet need a radical redesign. We are revisiting a piece penned back in December of 2014 in an effort to draw useful comparisons pertinent at the time to current conditions in the markets we follow today - along with a new and important technical condition in the precious metals market right now exhibiting conflicting messages - 'a tale of two cities' if you will. The primary message behind the piece entitled A tail of Two Cities in 2014 was to draw attention to the growing income and wealth gaps between the top 1% and the rest of us, the same inequality that brought on the French Revolution, which continues to widen by the way, because of implications pertaining to the future. Indeed, fast-forward to present, and it appears our fears were not unfounded, evidenced in growing poverty rates and nationalist / extremist political movements around the world, along with a collapsing middle class in the West. Of course if you listen to mainstream Western media, the picture would still appear 'sanguine' despite the radical changes gripping the status quo nexus, what Keynesians (think Fedsters) would have you believe is a healthy economy - which is of course a lie. In fact, it would not be a stretch to say what the 1%'ers have engineered is debt-induced stagnation that could possibly morph into a global Depression. Not that any such concerns matter to modern day aristocrats, or stock market for that matter, because as pointed out previously it's been reduced to a 'video game' by it's price managers via the machines, almost completely detached from fundamentals and reality. Instead, it's become a sentiment based gambling parlor now 'too big to fail' because it's importance is now 'systemic' - which is why it's defended by the status quo like the Bastille. Indeed, like the aristocracy and bourgeoisie of French Revolutionary times, the class war in the West continues to accelerate and become more draconian, where left unchecked, these megalomaniacs would continue to consume working classes up and down the line until it was just Jeff Bezos, Bill Gates, and Mark Zuckerberg left standing in the room congratulating themselves on how they got it all - until a knife fight broke out. So with any luck, before this madness goes much further, we see radical political change before such a dark age arrives, condemning the proletariat to lifetimes of despair and suffering. There is another way you know - but it's not the American way - so it's likely to be a rough road in getting back to any kind of harmony within the human experience. First 'the people' will need to regain the surreptitious loss of its liberties to the aristocrats and bourgeois types these past decades, and then radical political reorganization will be necessary. Because whether you realize it or not, the boys and girls in Brussels and Washington are in self-preservation mode folks, and the only way they will see continued success is by turning the authoritarian screws - stealing your liberties and wealth. In this regard then, one should expect nothing but more obfuscation, confusion, and lies from central planners moving forward, along with increasingly desperate measures, not the least of which being accelerating money printing in order to hide economies spiraling downward out of control. Eventually, as the numbers of disenfranchised from the system grows in critical mass, basic income initiatives will need to be introduced across the West, or the guillotines will be coming out. This was laid out in my work (series) entitled 'A Check in Every Mail Box' beginning in 2012, an eventuality envisioned almost five-years ago now. Thing is though, there's nothing bearish about this for precious metals, because a move to 250 in the above is inconsequential in terms of longer term prospects, where technicals on the monthly are undoubtedly bearish, where prices are set to continue plunging. What's more, and referencing the mixed technical picture referred to in the opening, where some weekly measures are 'stretched', it should be noted the vast majority of monthly measures across the precious metals sector remain unabashedly bullish, like the XAU / Gold Ratio pictured below, where it would in fact be appropriate this move is just getting rolling, with MA's and stochastics only recently turning higher. So be sure to take all this hawkish talk out of the Fed with a grain of salt, because it's nothing but opportunistic market manipulating double talk. Such a target, is the one pictured below, the Fibonacci resonance signature in the Gold / CRB Ratio (see below), suggestive while gold still has a great deal of upside, once the target is vexed, commodity prices will join the party. What does this mean? It means there's 'no free lunch', where helicopter money will eventually lead to some degree of hyperinflation on a global basis. This is why pension funds are doomed, it's not because they are low now. Because if rates do rise, the funds - all funds not just the pension variety - will not be able to cope with the implications of crashing liquidity. Helicopter money will do no good at this time because the effects of increasing money multipliers will send prices so high everything will come to a grinding halt - crashing the multipliers again - but not before the economy evaporates. It truly is a no win dilemma here too. And then we have the jobs report - what a con job. Thing is, these clowns can put out any number they want. Obviously, with the collapse in the numbers, they thought it was a good idea to put out a weak number this month to keep traders confused and off balance, sending everybody back to the other side of the boat sentiment wise. And this might happen in key precious metal ratios as well, where the logic is now that is evidenced the economy is collapsing, one need not hedge long exposures. In fact, for some (think idiot hedge fund managers), this might make naked bullish speculation in the derivatives market justified - you know - because they are looking for 'alpha'. Only thing is, because the Brexit thing will likely turn out to be 'Kabuki Theater' in hind sight if Brits remain true to form, with the jobs numbers forgotten by then, where the initial reaction of a 'no vote' will be viewed as a 'yes vote' for the status quo - yet another excuse to pummel precious metals and buy stocks. So, if the bearish COT situation for silver isn't burned off by then, and hedgers in the shares lose their desire to keep losing money against rising prices, sending open interest ratios lower, another counterintuitive move could be the result. So we are not getting excited about Friday's jobs numbers, or the reactions in the markets. Because if you think the status quo boys are done with this situation, you haven't been paying attention these past years - as these people are psychopaths who will not stop until their toys are taken away from them, or the whole thing blows up. Along this line of thinking, at present we have precious metals commentators looking at the situation in Comex gold right now, suggesting delivery defaults this month, which is yet another reason to lift hedges. Given the times this has happened in the past, underlying conditions were not as bad as today (physical supply, the economy, etc. ), still, in my opinion only the naïve would think some of the gold will not come out of eligible again to cover any deficits - that's if all these contracts are still standing in a few weeks - after the death threats or whatever else it takes to get these people (demanding delivery) to go away go out. What these people might be thinking (besides record physical demand), is they are front-running the Chinese because after they are slotted into the IMF SDR basket in September, they would be doing the same thing. Or maybe it is the economy - or Trump - who knows? Bottom line is it doesn't matter if you're not too worried about the short-term. At some point the stars will be aligned for both bullion and the shares, and the sector will make a meaningful move higher on its way to a Fibonacci 21-year blow-off in the 2020 to 2021 timeframe. Until then, because of circumstances described above, the likelihood is we still need to go through further sequencing involving technicals and sentiment before conditions for a lasting bottom to the present consolidation have run their course. The monthly reversals in both gold and the dollar($) last month point strongly to such an outcome, so this possibility cannot be ignored, even with the weekly reversals going the other way off the Employment Report. Again, if you think status quo'ers are just going to lie down and take what is coming without a fight to the death, you have not been paying attention these past years. Just watch what they do at Brexit time. Everything will be coming up roses again on a 'no vote'. Good investing is possible in precious metals. As British citizens cast their votes tomorrow in a referendum on whether the U.K. should remain in the European Union or leave it, uncertainty runs high over the economic and political repercussions, whichever way the result goes. The precise question British voters will face tomorrow is: “Should the United Kingdom remain a member of the European Union or leave the European Union?” According to Wharton finance professor Joao Gomes, U.K. voters will likely choose to remain in the EU. He cited latest opinion polls, which show the momentum to leave has abated. “When push comes to shove, people will find it very hard to vote for something they are not quite sure what it actually is,” he said. Nevertheless, uncertainty prevails until the votes are cast, he added. The murder last Thursday of British Labor member of Parliament Jo Cox caused the campaigns on either side of the referendum to be suspended for a couple of days. Cox was a pro-EU advocate. “The atmosphere in Britain has become so politically toxic that people took a step back and were horrified,” said Mallaby. “There is a sense that overplaying people’s fear of migration is something which the exit side – [people] who want to leave the EU – may dial back on,” he noted. Mallaby last year cofounded the web publication InFacts.org, which seeks to make a facts-based case for Britain to remain in the EU. Mallaby agreed. “One thing we do know precisely is that there are a heck of lot of things we don’t know,” he said. He advised against underplaying that uncertainty, and expected it to last not weeks or months, but years. A “leave” vote will have some clearly identifiable repercussions. For one, it would prompt Britain to renegotiate its relationship with the EU, said Gomes. He added that it is unlikely that David Cameron will continue as prime minister or George Osborne would continue as the chancellor of the exchequer. Mallaby agreed that a “leave” vote would likely cause the fall of Cameron’s government. But he also thought that the Conservative Party could take up to three months to choose a new leader. A “leave” vote would be good for the U.K., according to Gomes. He said a sharp depreciation in the value of the pound could boost its competitiveness and could “do wonders for economic growth.” That, in fact, would be what a new government in the U.K. would go after, he added. Gomes said that if the U.K. sees a sharp depreciation of its currency and that leads to greater economic growth, that would make it easier to convince Scotland that it made the right decision to leave the EU. It also makes it a lot easier for other EU member countries to reflect on why exactly they are in the EU, he added. A “leave” vote would create other complications, such as between Ireland, or the Republic of Ireland, and Northern Ireland, which is part of the U.K. He said Ireland achieved some economic stability in the late 1990s based on a porous border that allows free movement of people in search of work or business. “If you re-harden that border because the Republic of Ireland is inside the EU and Northern Ireland is out, that completely undermines the economic basis for Northern Ireland,” he said. A “leave” vote would also mean a lot of fresh paperwork. Domestic laws in the U.K. would have to be rewritten since much of it derives from the EU, noted Mallaby. Building a new status quo takes “an affirmative agreement,” and that is “extremely difficult” to achieve with 27 EU members, he said. He noted that when Greenland exited the EU in 1985, it cared about only one issue, and that was fish. That negotiation for Greenland to leave took three years, he said. In the case of Britain, it would take four to five years for it to finally leave the EU, he added. Much of the argument on the “leave” side stems from fears of the migrant influx into Europe seeping uncontrollably into Britain. Other factors strengthen that case. “As much as the migration issue is a vote-getter, the U.K. sees itself tied to a part of the world that is not growing, where people are not working [and] getting old, productivity is low, and we have these bureaucrats in Brussels – as they perceive them – just making life more difficult,” said Gomes. Mallaby said the impact on the financial services industry would be especially hard. He noted that Britain has a service-based economy with 78% of its GDP coming from services, and financial services forms the biggest part of that. If the U.K. loses membership in the EU single market, British firms will lose the ability to sell financial services across borders. THE peevishness of the campaigning has obscured the importance of what is at stake. A vote to quit the European Union on June 23rd, which polls say is a growing possibility, would do grave and lasting harm to the politics and economy of Britain. The loss of one of the EU’s biggest members would gouge a deep wound in the rest of Europe. And, with the likes of Donald Trump and Marine Le Pen fuelling economic nationalism and xenophobia, it would mark a defeat for the liberal order that has underpinned the West’s prosperity. That, clearly, is not the argument of the voices calling to leave. As with Eurosceptics across the EU, their story is about liberation and history. Quitting the sclerotic, undemocratic EU, the Brexiteers say, would set Britain free to reclaim its sovereign destiny as an outward-looking power. Many of these people claim the mantle of liberalism—the creed that this newspaper has long championed. They sign up to the argument that free trade leads to prosperity. They make the right noises about small government and red tape. They say that their rejection of unlimited EU migration stems not from xenophobia so much as a desire to pick people with the most to offer. The liberal Leavers are peddling an illusion. On contact with the reality of Brexit, their plans will fall apart. 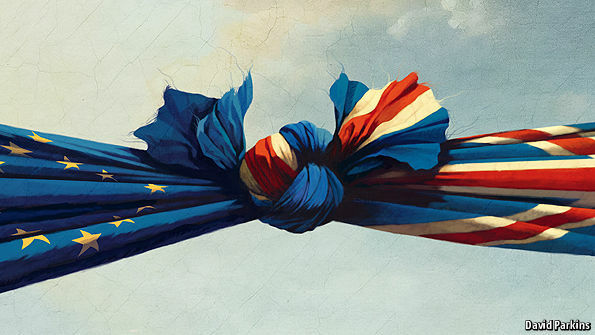 If Britain leaves the EU, it is likely to end up poorer, less open and less innovative. Far from reclaiming its global outlook, it will become less influential and more parochial. And without Britain, all of Europe would be worse off. Start with the economy. Even those voting Leave accept that there will be short-term damage. More important, Britain is unlikely to thrive in the longer run either. Almost half of its exports go to Europe. Access to the single market is vital for the City and to attract foreign direct investment. Yet to maintain that access, Britain will have to observe EU regulations, contribute to the budget and accept the free movement of people—the very things that Leave says it must avoid. To pretend otherwise is to mislead. Those who advocate leaving make much of the chance to trade more easily with the rest of the world. That, too, is uncertain. Europe has dozens of trade pacts that Britain would need to replace. It would be a smaller, weaker negotiating partner. The timetable would not be under its control, and the slow, grinding history of trade liberalisation shows that mercantilists tend to have the upper hand. Nor is unshackling Britain from the EU likely to release a spate of liberal reforms at home. As the campaign has run its course, the Brexit side has stoked voters’ prejudices and pandered to a Little England mentality. Despite Leave’s free-market rhetoric, when a loss-making steelworks at Port Talbot in Wales was in danger of closing, Brexiteers clamoured for state aid and tariff protection that even the supposedly protectionist EU would never allow. The pandering has been still more shameless over immigration. Leave has warned that millions of Turks are about to invade Britain, which is blatantly false. It has blamed strains on public services like health care and education on immigration, when immigrants, who are net contributors to the exchequer, help Britain foot the bill. It suggests that Britain cannot keep out murderers, rapists and terrorists when, in fact, it can. Britons like to think of themselves as bracingly free-market. They are quick to blame their woes on red tape from Brussels. In reality, though, they are as addicted to regulation as anyone else. Many of the biggest obstacles to growth—too few new houses, poor infrastructure and a skills gap—stem from British-made regulations. In six years of government, the Tories have failed to dismantle them. Leaving the EU would not make it any easier. All this should lead to victory for Remain. Indeed, economists, businesspeople and statesmen from around the world have queued up to warn Britain that leaving would be a mistake (though Mr Trump is a fan). Yet in the post-truth politics that is rocking Western democracies, illusions are more alluring than authority. Thus the Leave campaign scorns the almost universally gloomy economic forecasts of Britain’s prospects outside the EU as the work of “experts” (as if knowledge was a hindrance to understanding). And it dismisses the Remain camp for representing the elite (as if Boris Johnson, its figurehead and an Oxford-educated old Etonian, personified the common man). The most corrosive of these illusions is that the EU is run by unaccountable bureaucrats who trample on Britain’s sovereignty as they plot a superstate. As our essay explains, the EU is too often seen through the prism of a short period of intense integration in the 1980s—which laid down plans for, among other things, the single market and the euro. In reality, Brussels is dominated by governments who guard their power jealously. Making them more accountable is an argument about democracy, not sovereignty. The answer is not to storm out but to stay and work to create the Europe that Britain wants. Some Britons despair of their country’s ability to affect what happens in Brussels. Yet Britain has played a decisive role in Europe—ask the French, who spent the 1960s keeping it out of the club. Competition policy, the single market and enlargement to the east were all championed by Britain, and are profoundly in its interests. So long as Britain does not run away and hide, it has every reason to think that it will continue to have a powerful influence, even over the vexed subject of immigration. 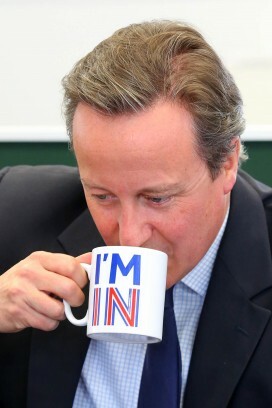 True, David Cameron, the prime minister, failed to win deep reform of Britain’s relations with the EU before the referendum. But he put himself in a weak position by asking for help at the last minute, when governments were at loggerheads over the single currency and refugees. Some Britons see this as a reason to get out, before the doomed edifice comes tumbling down. Yet the idea that quitting would spare Britain is the greatest illusion of all. Even if Britain can leave the EU it cannot leave Europe. The lesson going back centuries is that, because Britain is affected by what happens in Europe, it needs influence there. If Germany is too powerful, Britain should work with France to counterbalance it. If France wants the EU to be less liberal, Britain should work with the Dutch and the Nordics to stop it. If the EU is prospering, Britain needs to share in the good times. If the EU is failing, it has an interest in seeing the pieces land in the right place. Over the years this newspaper has found much to criticise in the EU. It is an imperfect, at times maddening club. But it is far better than the alternative. We believe that leaving would be a terrible error. It would weaken Europe and it would impoverish and diminish Britain. Our vote goes to Remain. REUTERS /A Brexit supporter at a Vote Leave rally in London. The pro-Brexit camp is pointing to Switzerland and Norway as models for how Britain could take advantage of the common European market without being an EU member. Experts say those prospects are a "fantasy." For Nigel Farage, the situation is simple. "The people of Norway (and) Switzerland ... are happy," says the head of the United Kingdom Independence Party (UKIP). "Those countries have their own deals, to maintain the type of trading relationship they want." It is a standard Farage line. His party, along with many in the Conservative party, is calling for Britain to leave the European Union. They want Brexit. On June 23, the British are voting on the issue and current polls show that it will be extremely close. David Cameron's government is warning of massive economic losses if the country's electorate chooses to leave Europe behind. His opponents argue that such talk is nothing but scaremongering. Switzerland and Norway, they say, aren't in the EU either -- and both countries are doing just fine. The argument sounds intriguing at first. Would it be possible for the British, who already have a special status when it comes many to many aspects of the EU, perfect their situation and mutate into a kind of nuclear-armed Switzerland? In other words, could the UK be part of Europe both economically and militarily, but without Brussels' bureaucracy and regulations? As charming as this may sound to many British voters, such an outcome is an illusion: Brexiteers are deceiving people. Neither the Norwegian nor the Swiss model is even vaguely realistic for Britain. That can be demonstrated fairly simply when it comes to Norway. The country has twice rejected the prospect of joining the EU and Norway has been part of the European Economic Area (EEA) since 1994. The EEA was established in 1994 and opens its members to a single market with 500 million consumers. But when they invoke Norway, Brexit campaigners decline to mention the price Oslo must pay to access the single market: EEA members are required to pay into the European Cohesion Fund, which offsets social disparities within the EU. Norway also takes part in a range of other EU programs and pays the same amounts for those as member states do. All told, this adds up to over 850 Million euros per year. If one takes into account how much money the UK currently receives from the EU, Norway pays almost the same amount per capita as the United Kingdom. Furthermore, Norway must adhere to countless EU guidelines, like the free movement of workers, without having a voice in EU institutions. Were the UK to leave the EU and join the EEA, the country would continue paying and continue accepting guidelines from Brussels -- but it would no longer have the opportunity to be part of the negotiations that shape the European market. "The British would lose their influence in the EU, but would have to follow all the rules," says Dennis Snower, head of the Institute of World Economy in Kiel. Originally from the US, Snower lived and researched in London for about 20 years and he describes the "economic irrationality of the Brexit advocates" as "frightening." Snower also considers the reference to the Swiss model to be a "fantasy, that is totally unrealistic" and sees the strategy being pursued by Brexiteers as emotional rather than fact-based. Switzerland isn't a member of the EEA, but it has negotiated over 150 bilateral agreements with the EU over the past 25 years or so. As a result, the Swiss can benefit greatly from EU free trade -- but not, for example, when it comes to financial services. That would be a significant problem for Britain: The financial sector is deeply important for the British economy. And Switzerland too continually adopts European regulations in order to ensure compatibility with the EU, but like Norway, it has no say in their creation. According to Stephan Breitenmoser, an expert on European law at the University of Basel, Switzerland's status would hardly be enough for the British. Additionally, he says, it is very difficult to make bilateral agreements with the EU. "The more specific the field, the more complicated it becomes," says Breitenmoser. The idea that Britain would attain Switzerland's status in the span of just two years -- the shortest length of time it would take for Brexit to become a reality -- is hard to imagine. That is particularly true since the EU would have little reason to make similar concessions to the Brits as they do to the smaller nation of Switzerland. An example: Switzerland's agreements with the EU on the freedom of movement of workers are static. Prior to July 1, 1995, the Swiss adopted all EU regulations pertaining to freedom of movement. But the Swiss are not required to automatically adopt all EU regulations on freedom of movent that have been passed since. Rather, they were able to negotiate with Brussels which regulations they would accept. The future of that special status is currently in question because Switzerland is seeking to introduce an annual ceiling for the number of immigrants it is willing to accept. "The static agreements hardly make sense for the EU anymore because of the rapid development of the laws," says European legal expert Breitenmoser. He believes it is unthinkable that Brussels would make such a deal with Britain. Whether that's true remains to be seen. What is clear, however, is that the Brits can't have everything. It won't be possible for the UK to turn its back on the EU politically while still maintaining all of the economic advantages of the single market. It is hard not to feel some sympathy for Pedro Sánchez these days. The leader of Spain’s Socialist party is busy travelling the country, giving speeches and interviews, smiling, rallying, hugging and doing all the other things politicians do in an election campaign. Yet the confidence is gone, as is the requisite optimism. If the polls are right, Mr Sánchez is on course to lead his party to yet another painful defeat on June 26. This time, however, Spain’s Socialist Workers’ Party (PSOE) looks likely to be beaten not just by the centre-right Popular party but also by the far-left Unidos Podemos movement. According to recent surveys, the once mighty PSOE will come a distant third in this month’s general election, with just 20 per cent of the vote. Not only will it not lead the next government. Barring an unlikely late surge, it will not even lead the Spanish left. The decline of the PSOE is, of course, part of a broader story. In Germany, the Social Democrats are polling around historic lows, as are the French Socialists under their unpopular president. Pasok has turned into a splinter group in the Greek parliament. In the UK, meanwhile, the venerable Labour party has undergone something of a reverse takeover, and is currently led by a politician who spent his entire career on the party’s leftist fringe. With few exceptions — Italy being the most obvious — the European centre-left finds itself in the midst of a long and painful retreat. The Spanish case is interesting for two reasons. The first is that the PSOE has played an outsized role in national politics since the end of the Franco dictatorship, ruling Spain for 21 out of 39 years. That success reflects not least the fact that Spanish society tends towards the left: polls consistently find that the average voter is slightly left of centre. More than 32 per cent of respondents in a recent CIS poll identified as Socialists, Social Democrats or Progressives — while only 18 per cent referred to themselves as Conservatives or Christian Democrats. If the Socialists can’t make it here, can they make it anywhere? The second reason is that Spain offers a textbook example of the travails that have befallen the centre-left. Call it a crisis of representation. Call it a capitulation to neoliberalism. Call it horribly unfair. The fact is that in Spain and elsewhere in Europe, voters have come to associate the centre-left with many of the (unpopular) policies traditionally championed by the right: austerity, deregulation, liberalisation, free trade. In Spain, the defining moment of that trend came in 2011, when the previous Socialist government sought to appease the markets by writing a deficit cap into the constitution. 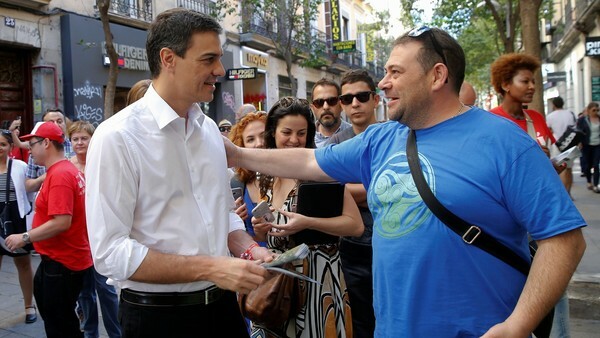 Coupled with a battery of austerity measures and budget cuts adopted by the same government, the constitutional amendment convinced many of the PSOE’s core voters that the party had lost its way. They saw — rightly or wrongly — that the party of the welfare state, of the public sector and of the blue-collar worker had turned its back on all three. They saw their jobs disappear by the millions, and yet there was no one around to even articulate their fear and their anger and their frustration. Socialist leaders thought they were simply bowing to reality. But along the way they left millions of core supporters without a voice. Mr Sánchez himself did a decent job of keeping the PSOE relevant in the months since Spain’s inconclusive general election last December. But his political space has shrunk dramatically. He is stuck between a centre-right that promises tax cuts and more supply-side reforms, and a new left that calls for an end to austerity and that credibly channels the anger on the streets. It is a dilemma that Mr Sánchez looks unlikely to resolve — and that could haunt Europe’s centre-left for many years to come.